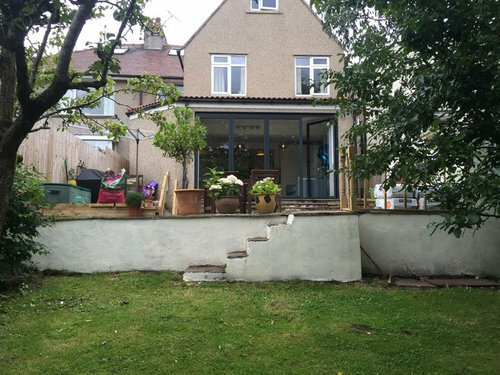 We have just moved into our new house and are loving the bi fold doors and patio however the 5 foot drop with a 5 year old is not so great. I originally wanted to move the steps to one side (still considering) and have a glass rail going across. However the quote was over £2.5k and not something right now we can afford. I really want to keep the square-ness and not obscure the view too much from the lounge over the patio down the garden. The patio is about 8m across. Any suggestions greatly appreciated. Ps the preset wooden rail construction was left by the last owners and very wobbly. Thank you very much. That looks good just need to check if 5 year old daughter safe. I'm sure she will be, they are a registered company and the glass conforms to British Standards, but i'm sure they won't mind at all if you ask questions.........why would they? There are many such adverts on Ebay and lots of other Online Ballustrades Companies. Good luck, can't wait to see the finished pictures. By the way, it is possible to get gates for glass ballustrading, so do ask , it'll negate the need to demolish and move the steps. Thank you so much for your time. The stairs need to go as quite awkward and steep. For some reason I have taken a dislike much to the despair of my husband who has visions of me with a lump hammer. It never ceases to amaze me what they don't notice, so maybe not !! I like the glass idea, but you could also go for simple metal railing in a dark colour. That won't obscure the view, is easy to install and you can incorporate a gate to prevent a certain tiny person from tumbling down the steps. The steps look as if the risers are different heights - which is potentially dangerous. 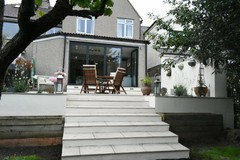 You could make steps going down to the lower level the whole length of the patio. This would give little ones a place to sit and play. Then on the top level you could put oblong planters along the edge, fixing them so they can't be pushed, so that people don't fall off when pushing a chair back from a table, leaving a space for exit for the steps. The planters don't have to be tall and if you plant something like ferns (if shady) or shorter grasses (if sunny) they shouldn't obscure the view when sitting. Think before you use glass panels. There are clean glass panels and glass panels that a five year old and the elements have streaked and smeared! That is a really good point. I had considered wooden planters either the side of steps at the bottom but your idea is brilliant. You are right the steps are different heights and quite dangerous. Many thanks. I think I need to spend tomorrow pulling out weeds and having a good think. hi, my idea would be to bolt a handrail to the wall to prevent anyone falling off the edge and possibly reforming the steps to make them even in height and level. 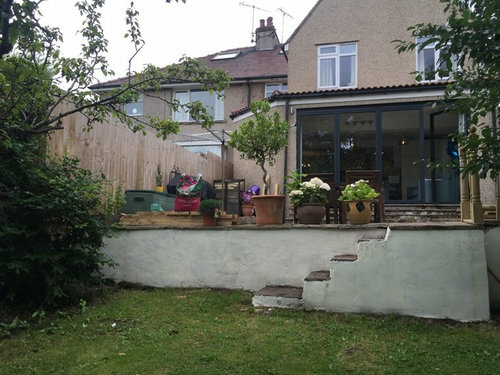 could you put a little slide from the patio to the grass might be fun , get rid of the steps they look quite ugly - move to the side, I like the metal railings idea would be easier to keep clean than the glass esp. with little hands around. 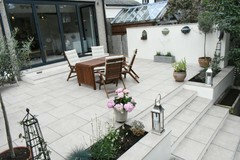 We decided to wait as the patio itself was poorly laid including slabs upside down. Thanks to the amazing team at SG Landscapes we now have this fantastic outdoor room. Quite a transformation. Well done! Stunning, so nice to see it finished. Thank you for showing us the final pictures- it looks amazing! Enjoy! The budget option is to fix some posts (or 2 by 4's) to the wall firmly and use them to hold a screen or horizontal timber. 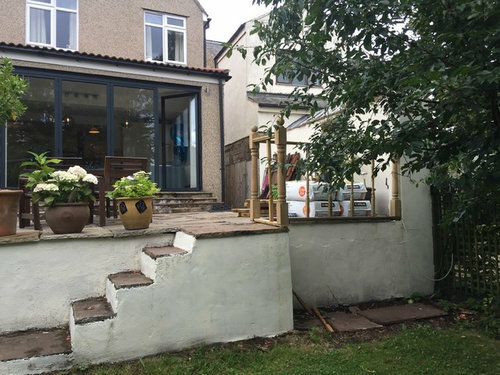 Patio doors - sliding or bi-fold? Help! Has our polished concrete patio gone wrong? Sawn or riven Indian stone for patio?